In order to achieve this functionality we need to construct a class of our own. We can use the objects of this class wherever we need this functionality to be implemented. The code for generating the class is given below. Every Object of the above class will hold two values in it. Data: The background ID or Value or Data for corresponding displayed texts. Description: The text or String that needs to be displayed. Now, we can use this class by creating its objects. The following example shows the use of the above Class. The above code snippet shows the use of the class DataDescription. 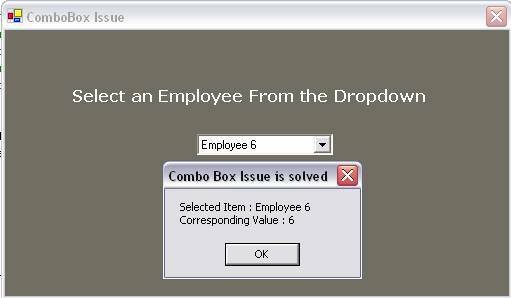 The FOR loop towards the end is adding the ITEMS to the combo box/dropdown is a loop. Inside this loop we are using DataDescription class to create the Id/data and description pairs. These pairs are added to the dropdowns. Hve a look at the accessing method of the data and descriptions from the combo box. The above code is written to get the details of the SelectedItem from the Combo Box. One can easily notice the use of the member variables (Data, Description) of the newly created Class DataDescription for accessing the Selected Items. The mentioned code will generate a message box displaying the Display Text with the underlying Data for the SelectedItem. It will look like the following.